^ a b c "Blade II". Box Office Mojo. Retrieved 2008-12-13. ^ Bill Higgins (April 1, 2002). "A party with a bite". Variety. Retrieved 2008-12-13. ^ Michael Fleming (March 25, 2002). "Helmer scales mountains". Variety. Retrieved 2018-12-24. ^ Ellen Wolff (July 21, 2002). "Artists flaunt character development at confab". Variety. Retrieved 2018-12-24. ^ Variety staff (March 22, 2002). "Weekend Box Office Preview (March 22, 2002)". Variety. Retrieved 2008-12-13. ^ Dave McNary (March 31, 2002). "Col's "Room" at the top". Variety. Retrieved 2008-12-13. ^ Don Groves (April 1, 2002). ""Ice" the rage o'seas". Variety. Retrieved 2008-12-13. ^ Don Groves (April 8, 2002). ""Ice" ages well overseas". Variety. Retrieved 2008-12-13. 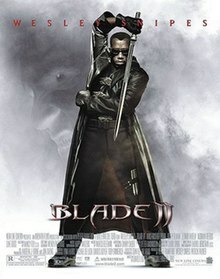 ^ "Blade 2". Rotten Tomatoes. Retrieved 2011-01-06. ^ "Blade II :: rogerebert.com :: Reviews". Rogerebert.suntimes.com. March 22, 2002. Retrieved 2011-01-06. ^ "Blade II - Reelviews Movie Reviews - James Berardinelli". Reelviews.net. Retrieved 2011-01-06. ^ O'Neal, Sean (August 24, 2016). "The Judgment Night soundtrack foretold the rap-rock apocalypse". The A.V. Club. Retrieved 2016-11-01. ^ Min, Lilian (August 13, 2015). "The Hits and Misses of Marvel Comics Movie Soundtracks". Pitchfork. Retrieved 2016-11-01.